High Commissioner for Human Rights, Navi Pillay, addresses the opening of the Human Rights Council’s twenty-fourth regular session. As the main United Nations human rights body began its work today on a range of topics, the world body’s top rights official said little doubt remains that chemical weapons were used in Syria and she urged a political solution to the suffering that has reached unimaginable levels. Addressing the opening of the 24th session of the Human Rights Council in Geneva, UN High Commissioner for Human Rights Navi Pillay said the international community “is late, very late to take serious joint action to halt the downward spiral that has gripped Syria” where more than 100,000 people have been killed, 4 million displaced within its borders and another 2 million in the region. “This appalling situation cries out for international action, yet a military response or the continued supply of arms risk igniting a regional conflagration, possibly resulting in many more deaths and even more widespread misery,” Ms. Pillay continued, adding that while there were “no easy exits, no obvious pathways out of this nightmare,” Member States, together with the UN, must find a way to bring the warring parties to the negotiating table. 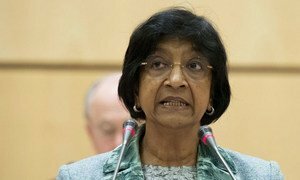 While the “world gazes in horror upon Syria,” Ms. Pillay urged the Council to also consider the situations of other peoples around the world struggling to assert their right to live in dignity and security. In that respect, she expressed deep alarm at the resurgence in the indiscriminate sectarian violence which has led to more than 1,800 recorded deaths in the past two months alone. She called on authorities “to do the utmost to protect all people in Iraq” and urged them to carry out a “fully independent, thorough and transparent” investigation of the recent killing of at least 52 people in Camp Ashraf north of Baghdad. The UN human rights chief also noted that authorities have not yet responded to UN and international calls for a moratorium on the death penalty, and continue to periodically execute people “in batches”. A total of 123 prisoners were executed in 2012, and another 75 so far in 2013, Ms. Pillay said. Turning to Egypt, the senior official she remains alarmed at the continuing violence in the country and urged independent and transparent investigations into killings and other violations that have occurred in recent weeks and earlier. “The path to stability in Egypt lies in its ability to establish the rule of law in an inclusive manner that ensures that all Egyptians, irrespective of their political opinion, gender, religion, or status, are recognized as legitimate stakeholders in the future of their country,” Ms. Pillay said, adding that she awaits a positive response to a request to deploy a mission to the country to assess the human rights situation. Meanwhile, Egypt has offered to host a regional Office of the High Commissioner for Human Rights (OHCHR) in Cairo, which is in the early stages of planning. On Bahrain, Ms. Pillay said the deep polarization of society and the harsh clampdown on human rights defenders and peaceful protesters remain a serious concern. She reiterated her calls on authorities to fully comply with its international human rights commitments, including respect for the rights to freedoms of expression, peaceful assembly, and association. The UN human rights chief also urged greater cooperation with the Government, which cancelled a scheduled visit of the Special Rapporteur on Torture, stalled on an OHCHR follow-up mission to the country, and has yet to implement recommendations made by the Bahrain Independent Commission of Inquiry. Turning next to Turkey, Ms. Pillay urged more consistent protection of the right to peaceful protest, including freedom of expression and assembly, to refrain from excessive use of force by the police and to fully investigate all instances of such excessive use of force. Her comments follow a decision by the European Court of Human Rights concerning the disproportionate use of force by Turkish police, including the conclusion that the practice of firing tear gas canisters directly into demonstrators was unlawful. “There is some hope in Mali,” Ms. Pillay told the Council, where since the signing of the Preliminary Agreement on 18 June, allegations of grave violations of human rights have markedly decreased. The human rights situation remains fragile in the north, she noted, with continued reports of summary and extra-judicial executions, forced disappearances, torture, arbitrary arrest and detention and looting of private property. Ms. Pillay also highlighted a recent visit to the Democratic Republic of the Congo by Deputy High Commissioner Flavia Pansieri who witnessed renewed fighting around the city of Goma, and strongly denounced indiscriminate bombing of civilians as a violation of international humanitarian law. “The scale of sexual violence committed by armed groups, defence and security forces, as well as civilians, remains alarming, with many victims awaiting justice,” Ms. Pillay said. She also noted a visit to the Central African Republic by Assistant Secretary-General for Human Rights, Ivan Šimonovic. A fact-finding mission is due to report to the Human Rights Council on the degradation of human rights in the CAR combined with the collapse of law and order and the ensuing climate of insecurity and impunity. Ms. Pillay also spoke about Sri Lanka, where she recently wrapped up a visit, as well as Israeli and Palestinian relations, Myanmar, South Sudan, and Tunisia, among other countries of concern for human rights violations. The UN human rights chief also noted that her office is preparing a report on migration and human rights for the high-level dialogue on international migration and development due to take place at the General Assembly in New York later this month. She also reiterated to the international community the need for a new universal, balanced and human rights-based development framework in the post-2015 agenda, another topic that will be discussed at the GA. Although the fighting is over, the suffering is not, the United Nations human rights chief today said wrapping up a week-long visit to Sri Lanka where she warned that the country is sowing the seeds of future discord by limiting personal freedoms and human rights.